A ginger compress is a very effective natural remedy that has been used in the East for centuries to dissolve stagnation, stimulate blood circulation and relieve chronic pain such as backaches, rheumatism, arthritis, swellings and aching muscles. It is a powerful treatment to draw out toxins and dissolve hardened accumulations like kidney stones, gallbladder stones, ovarian cysts and fibroids. What Is A Ginger Compress? A ginger compress is hot ginger water that is applied directly to the skin with a piece of cloth that has been dipped into it. What Are The Benefits Of Ginger Compress? 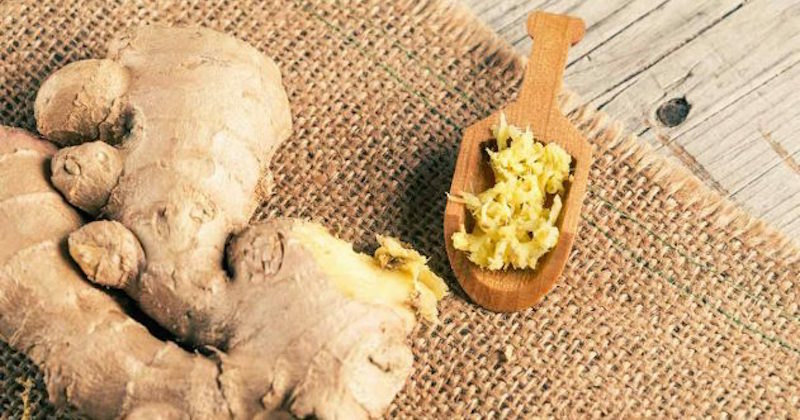 Here is an easy step-by-step guide to make a ginger compress at home. 120g of fresh ginger roots work best, if you cannot find fresh ginger, use 1 tablespoon of powdered ginger. A large pan with lid. 1 large towel and 2 hand cloths. A small cotton bag with string to close it. You will put the ginger in here and use it like a tea bag to infuse ginger into the pan of water (without getting grated ginger bits into the water). Pour the water into the pan and bring to just below boiling point (leave the lid on to keep the temperature constant). Meanwhile grate approximately 120 gram of ginger (or prepare 1 tablespoon of dry powdered ginger), put it in the cotton bag, and close with string to create a type of fresh ginger teabag. Squeeze out the liquid of the fresh grated ginger into the pan and then drop the entire bag in the water. Leave to infuse for 3-5 minutes. At this point you can turn off the heat. Carefully remove the bag and squeeze out (with your gloves) the last of the juices to release all the benefits of ginger! The pan should now contain 1 liter of fresh ginger water and you are ready to start applying your ginger compress. You can apply ginger compress yourself or get a friend to help. The treatment will take about 30 minutes, so make yourself comfy. Basically you are going to repeatedly apply a cloth soaked in hot ginger water to the affected area. The warmer the compress, the better, so wear your gloves throughout the treatment to avoid burning your hands. 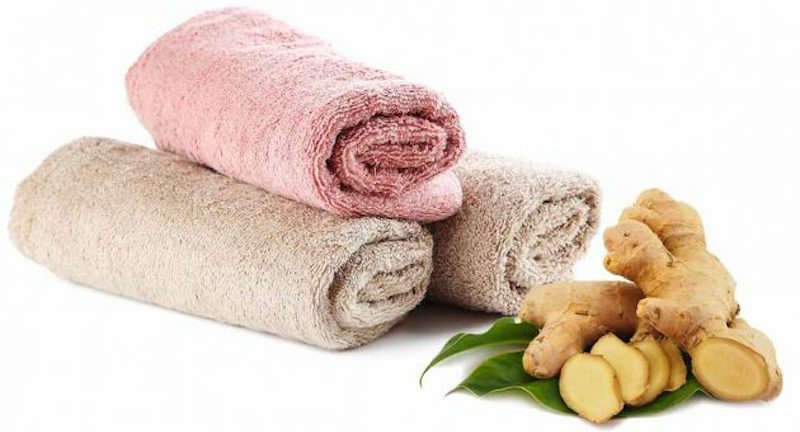 Soak the hand towel thoroughly in the hot ginger water, remove and squeeze to remove dripping water. Tip: re-cover the pan with the lid to keep the ginger water warm. Fold the steaming cloth and place it directly on the skin of the area you want to treat. Do the same with a second cloth and put it over the first one—this will help maintain the heat and moisture. Cover them with the larger dry towel. Tip: The towel must feel hot on the skin but it shouldn’t scald! Slight reddening of the skin is normal, like if you stay in a hot bath for some time! Keep the ginger compress in place for 3-5 minutes, or until the compress begins to cool. Repeat the procedure (steps 1 and 2). Tip: For a more effective treatment, aim to keep a stable temperature throughout. The skin should not cool off between applications. Carry on for about 20-30 minutes until you will notice that the skin has become red. A ginger compress treatment can last from 5 to 30 minutes, depending on what you are treating and the severity of the condition. The ginger compress applications may be repeated every few days until symptoms go away. For instance, in case of an ovarian cyst it is recommended to carry on applying ginger compress (followed by a taro plaster) once a day for at least two weeks. In case of mastitis, it is recommended that you apply the ginger compress to the affected area three times a day until the problem disappears. Never let the water boil, otherwise ginger will loose its healing properties. If the water cools down during treatment, you can reheat it, but without boiling it. It is possible to put grated ginger straight into the pan without using a bag. The downside of this is that some bits of ginger may end up on your skin while applying the compress and may be a little messy. Caution: ginger compress should not be applied on babies, pregnant women, to the brain area, in cases of high fever, or on cancerous tumors.